Yesterday I looked at the Virgin America lounge at Los Angeles and showed you their impressive economy and premium economy short-haul product. 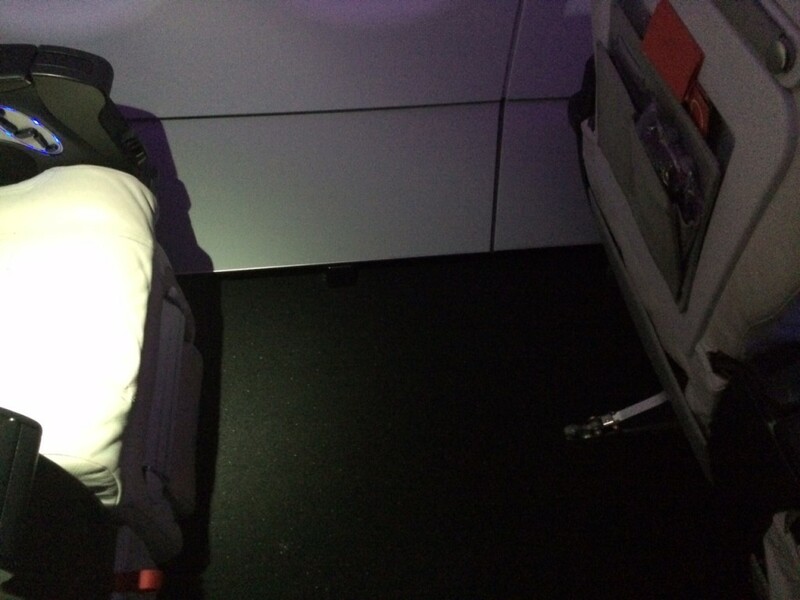 This is my review of my First Class flight on Virgin America. Why First Class? Because I thought it would be interesting – even though the flight from Los Angeles to Las Vegas is similar to a Heathrow to Amsterdam hop. Let’s put the cost into context. I paid $199 for a one-way First Class ticket, so around £130. That is pretty much identical to what British Airways charges for half of a Club Europe return ticket as long as you stay away for a Saturday night. Don’t try buying a one-way Club Europe ticket for that price because BA won’t sell you one. Does this look like Club Europe to you? I apologise for the dark pictures but, as I mentioned in part 1 of this review yesterday, they insist on keeping the blinds down all the time! There are only two rows of First Class meaning a total of eight seats in all. Because the number of seats is fixed, there is a proper bulkhead between First Class and Main Cabin Select. Unfortunately, because the flight time from Los Angeles to Las Vegas is pitifully short, it is difficult to say much about the Virgin America service in general. They do serve what look like pretty decent meals on longer flights. On my 50 minute hop, I was offered a choice of crisps or cookies from a basket. I was offered a drink before take-off and I had another in the air. The rest of the time was spent playing on my iPhone as I was able to buy 30 minutes of internet access for a whopping $3. I didn’t even get the TV out to see what was available. Or visit the loo. Sorry about that! I do hope you get a feeling from the pictures above, though, that this is very much a cut above your normal US or European short-haul carrier. 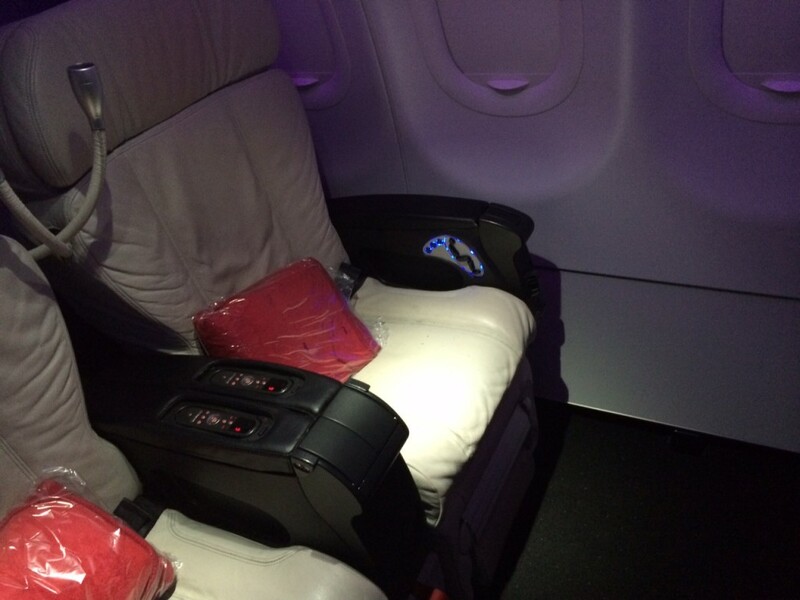 Can you redeem Virgin Atlantic miles on Virgin America? The snag – as with all Virgin Atlantic partners except Delta – is that you can only book return flights as redemptions. As I was flying back to London on a direct flight from Las Vegas, this was no use to me. The Virgin America redemption chart using Virgin Atlantic miles is here. Assuming $400 for a return First Class between LA and Las Vegas, 20000-25000 miles (depending on which band it dropped into) looks like pretty good value. 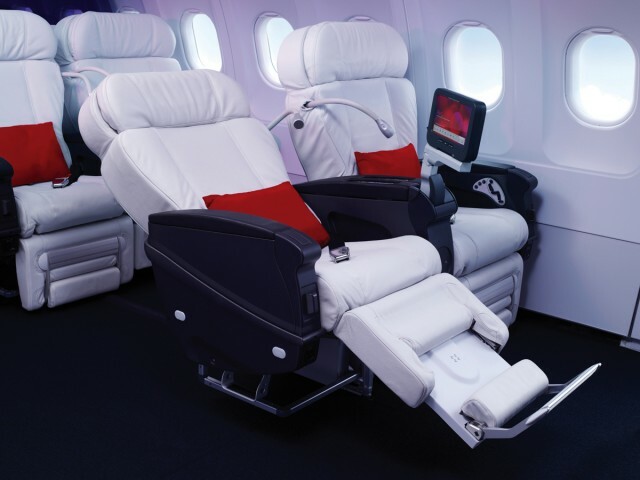 Would British Airways ever go for seating like this in Club Europe? No, it won’t. But it does pose a big risk to BA if someone else tries it. Virgin America is a point-to-point airline, like easyJet and Ryanair. British Airways has a huge number of connecting passengers. The ONLY reason that Club Europe still exists is that a lot of connecting passengers would abandon BA if they had to downgrade to economy for the European leg of their trip. 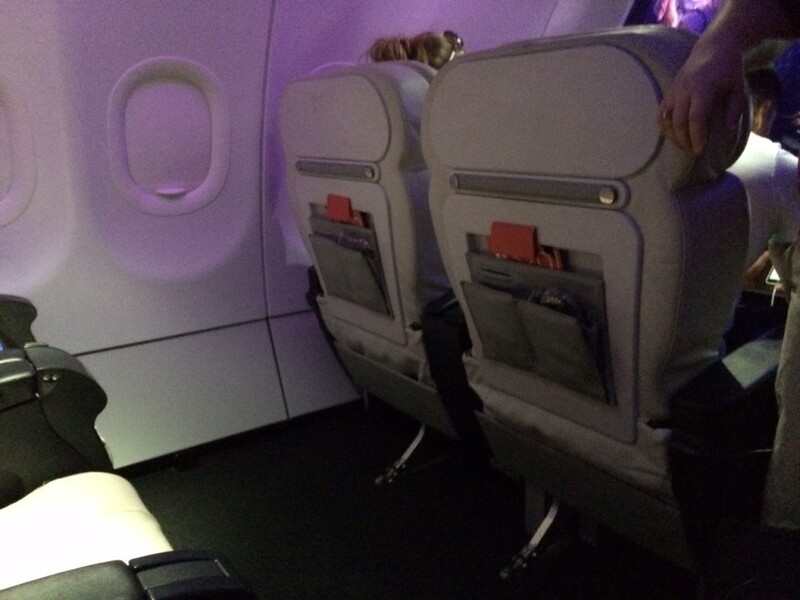 With a cabin like Virgin America, you are capped at 8 premium seats. This would be a nightmare for British Airways. If all eight seats were sold, someone looking to fly New York to, say, Hamburg would only be offered economy for the London-Hamburg leg. It is very possible that such a flyer would decide not to give British Airways £4,000 and instead fly Lufthansa via Frankfurt – as long as Lufthansa had a business class seat for the last leg. BA requires the flexibility to make Club Europe as large or as small as is necessary, and to be able to fit in extra passengers at short notice. Let’s imagine, though, that easyJet decided to bring in seating like this. It isn’t totally crazy – you take out 4 rows of 6 seats and replace it with 2 premium rows of 4 seats. You would need to be able to sell them for 3x the price of a standard seat but that isn’t impossible. I admit that easyJet would also have to upgrade its entire image and ‘look’ in order to make it work – the cabin also needs to feel classy and upmarket. It might be possible though. How would BA respond to that? You now have Club Europe seats offering 30 inches of legroom in the refurbished planes. These seats offer 55 inches of legroom. What protects BA is its entrenched position at Heathrow which suits those who live in West London and those whose offices are within easy reach. I’m not sure that corporate passengers would head out to Gatwick that easily even if they were promised a 55 inch seat pitch. Virgin America shows that it is not impossible to run an impressive short-haul premium service in the 21st century – the key is whether anyone else responds. How much are the taxes and charges on virgin america on a redemtion, for example on a coast to coast flight. Do they vary with class of seat? Nominal. On Avios redemptions, US domestic flights have £3 tax each way regardless of class. US airlines do not impose fuel surcharges on reward flights, in general. OT, but just had an email from Redspottedhanky – they’re introducing a booking fee of £1 and delivery charge for postal delivery. Can’t say I’m surprised, given how much £ they give away each year! Oh well, £1 of my free vouchers each time will go on their fee, and I’ll collect the tickets at the station from now on! We flew San Francisco to Las Vegas in first with Virgin America as it was cheaper to fly first then economy and had a great experience! VA found a fault with the plane after we had boarded and quickly found a replacement for the flight. Our silver lining was that we got to see Air Force Once land at SFO due to the delay. I wished BA had designed their business section like VA as it was a great way to travel!